Information and communication technologies (ICT) are transforming the way of work and driving change in many industries. As per a report, Government agencies in different countries are facing revenue and expenditure pressures that will only intensify in the coming decades as the population ages. So as an information technology service provider company, CDN Solutions Group have mission and vision to solve technology issues of industries. This year, we are coming in CeBIT Australia 2017 with a strong motive to provide smart solutions for e-government sector. CDN Solutions Group is exhibiting in CeBIT Australia for the 8th consecutive time. 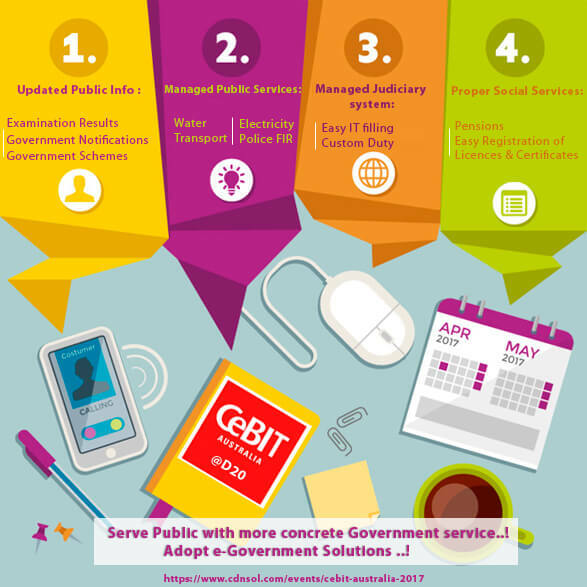 This year, we are coming with an agenda to unblock all the smart solutions of e-government sector in CeBIT Australia 2017 at stand D-20 during 23rd – 25th May 2017 in International Convention Centre Sydney. Our delegates are available in Australia from 13th May to 5th June 2017 in Sheraton hotel. They will visit different cities such as Melbourne, Sydney, Adelaide, Perth, Brisbane, etc to increase business technology awareness and provide innovative solutions. So if your business is facing a difficulty that our IT services can solve the do not hesitate to fix a meeting with us to meet in Australia. Coming back to e-government smart solutions. So to become global leaders in e-government services, government organizations need to grab user-experience techniques by analyzing user journeys to determine their behavior when they interact with e-government services. With an experience in developing e-government solutions, CDN understands the key aspects of government ICT. We have good experience of developing e-Governance solutions and we can built customized solutions that address the entire spectrum of the information technology needs of government. If you are an government agency or organization and need efficient and smart e-Government solution, then do meet us in CeBIT Australia 2017 at stand D-20 to find cutting edge solution for your sector.